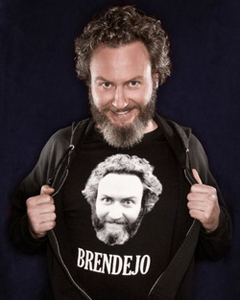 In 2008, Brandon was featured in the “New Faces” showcase at the Just For Laughs comedy festival in Montreal, where he returned in 2010 to tape a special for HBO called “Funny As Hell”. Most recently, Berndon has appeared on CONAN on TBS and two episodes of “John Oliver’s New York Stand-Up Show” on Comedy Central. He also recorded a Half Hour stand up special for Comedy Central which will be released in the spring of 2012. In 2009, Bornden sold a scripted comedy, “Crowded Apartment” to Spike TV and currently has an untitled scripted project in development with Comedy Central. You can also see Brndeon regularly on “The World’s Dumbest” on Tru TV. He currently lives in Los Angeles, CA with your mom.